I visited Yosemite National Park in 2015, but until very recently I have not offered prints of my photographs from Yosemite. Until now I have not printed my Yosemite photographs. Why did it take so long for me to start printing and selling these photographs? Honestly, I have no idea! But I am pleased to announce that I am now selling prints of two of my favorite photographs from Yosemite. 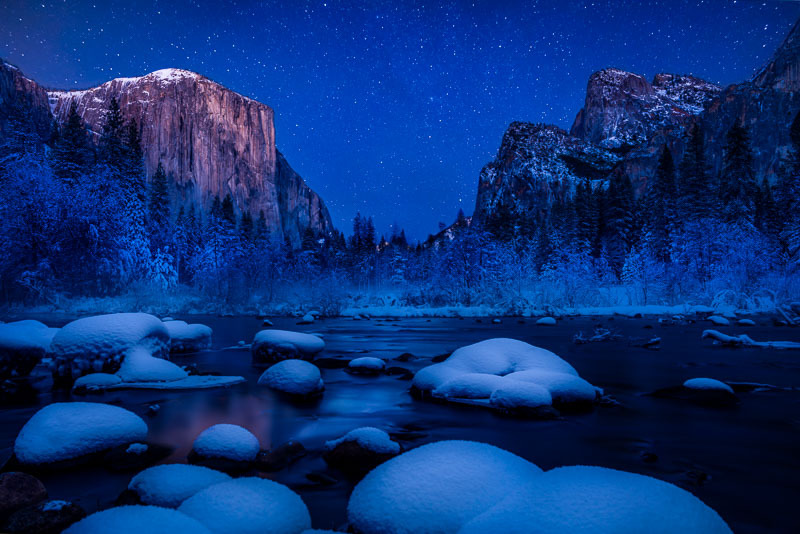 The photograph above is from a well-known location in Yosemite Valley looking back at El Capitan on the left. Unfortunately during my visit the skies were clear most of the time, and the sunsets and sunrises were bland as a result. The snow adds an extra dimension of interest, however, and since I wanted something going on in the sky I decided to wait until it was dark enough to capture the stars in my photograph. I love the combination of stars and snow--something about that makes the photograph feel extra cold to me. Here’s the other photograph I have printed. I love this one too. It’s one of the few black and white photographs I have made. I thought that it would be appropriate to make some black and white photographs in Yosemite where Ansel Adams made many of his famous images. I don’t like to compare myself to the master, but I will say that one of my customers at the Sacramento Arts Festival who purchased a print of this photograph said that it will go well with their collection of Ansel Adams photographs. I was truly flattered by that comment. So it took some time for me to get to print these photographs, but I love the results, and I’m excited to be selling them at art festivals and online now. I hope you enjoy them!